When you enter the apartment 511 you walk through a small hall leading immediately to the large 40 square meter lounge and dining area which overlooks the terrace via its large patio doors. To your left you will find the open plan kitchen with breakfast bar, white silestone tops & premium appliances. Carrying on through the lounge past the dining area, you find the second bedroom to your right and bathroom to your left. Continue to the end of the hallway to find the large master bedroom of 18 square meters. On the left of the bedroom entrance you have ample built in wardrobes and in front of those is the en suite bathroom. Continue through the bedroom to the patio doors from which you can access the sunny terraces. To the left of the terrace off the master bedroom you also find the access steps to your upper level private sun terrace with a generous 29 square meters and spectacular panoramic views. Are you looking for a modern living with space and light in a quiet location but yet close to everything? 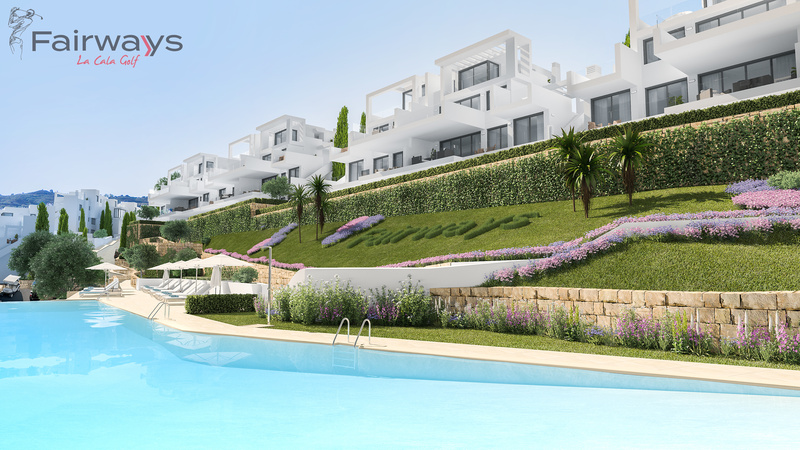 Welcome to our new development Fairways La Cala Golf! Fairways has been especially designed for today’s buyers – large terraces – lots of light – open plan – luxury materials – private spa and gym – in a beautiful setting front line golf but only 10 minutes drive to the beach! Fairways is located inside of the beautiful La Cala Golf Resort, where you will find several restaurants and sports facilities, such as three 18 hole golf courses, tennis courts, paddle tennis, riding, mountain biking, hiking and more! The wonderful beach of La Cala de Mijas is reached in less than 10 minutes by car. The airport of Malaga is only 35 minutes away and you can easily go to both Marbella and Fuengirola that are both close by. The development consists of 54 magnificent 2 and 3 bedroom apartments. All with extra smart solutions to maximize both indoor and outdoor areas. Terrace sizes starts at 53m2 and the garden apartments also enjoys private gardens up to 121 m2! Prices are incredible starting at only 255 000 Euros for a 2 bedroom apartment with 97 m2 terraces plus 53 m2 private garden!